Welcome to the #LoveOzYAbookclub debut book selection! This month’s book is our very first, and the only book I get to choose – after November, the title selections will be made by the authors of the books under discussion. I spent a long time thinking about which title to choose…and finally made a decision by asking myself Which book would I want to read more than any other? So…*drumroll*… our book for the month of November will be Illuminae by Amie Kaufman and Jay Kristoff. 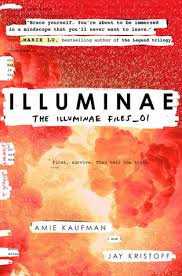 Illuminae is the first book in The Illuminae Files series, and has been described as “a fantastically entertaining space opera with explosions and romance” combined with “a thoughtful and expansive tale of political intrigue and subterfuge”. It’s one of the biggest things to come out of Australian YA in a long time – it’s already hit the New York Times Bestseller List. It’s also (if you have a quick glance at the insides) a mashup of graphic design and story – in fact, I’ve never seen anything quite like it. AmieKaufman is the co-author of the Starbound Trilogy with Meagan Spooner, and Jay Kristoff is the author of The Lotus Wars series, and they both live in Melbourne and are both quite lovely. Amie and Jay have already agreed to choose a title for #LoveOzYAbookclub for next month. I've made an arrangement with Boomerang Books (who specialise in Australian books and had all the titles I searched for at excellent prices) so that #LoveOzYAbookclub members can get free shipping. If you would like to order the book through Boomerang Books, use the code loveoz at the ‘use a promotional code’ step, and you won't have to pay for postage. So go forth and read! I hope you enjoy Illuminae, and I’ll look forward to the discussion we’ll have about it at the end (probably early in the last week) of November here on the #LoveOzYAbookclub group.